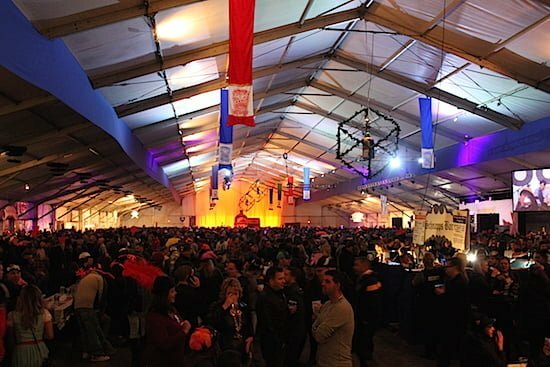 WATERLOO, ONTARIO — Bingemans has been involved with the Kitchener-Waterloo Oktoberfest from the beginning but the company’s president, Mark Bingeman, says over the past couple years the organization has super-sized its involvement in order to create a significant German fest hall feel. He’s not kidding. If you want an idea of just how far Oktoberfest has come look no further than Bingemans, where the festival began its amazing run on October 14, 1969. Oktoberfest revellers at Bingemans can look forward to traditional Oktoberfest food, exclusive entertainment and express access to the main festivities in the Oktoberfest Kool Haus. A daily family-friendly Bavarian Carnival is filled with rides, games, entertainment, activities and food. It costs $35 for a family of four or $10 per person, and the entry fee includes rides. Oktoberfest is a success story and the numbers are staggering, attracting more than 700,000 people last year. It is the largest Oktoberfest celebration outside of Germany. If you’re into #beermath, Molsons calculated that 2,000 hectalitres of beer was consumed during the course of the 2015 festival. So if put in standard 341-millilitre bottles there would have been about 580,000 bottles consumed. At nine inches per bottle, that’s 134 kilometres – from Kitchener to the base of the CN Tower in Toronto. Yes, someone actually figured that out. All of that beer, of course, goes down with thousands of pounds of sausages, pigtails, sauerkraut and other German and Waterloo County fare. Today Kitchener-Waterloo Oktoberfest is the largest Bavarian festival in North America with the greatest Thanksgiving Day Parade in Canada, featuring more than 40 family and cultural events. The local economy is stimulated and 70-plus charities and not-for-profit organizations raise funds to support the high quality of life enjoyed in the region. Oktoberfest has several other Festhallen choices as well as Bingemans, including Alpine Club, Cambridge Bavaria Haus, Elmira Kiwanis Haus and Oktoberfest Haus. It also goes without saying that you can’t go to Kitchener-Waterloo Oktoberfest without saying hello to Miss Oktoberfest 2016. This year Vanessa Buttinger is the 48th Miss Oktoberfest and will be making appearances throughout the festival.